In January we introduced you to Samwise, the three month old kitten who defied the genetic odds. Why is he so special? Because he is a boy with a tortoiseshell colouring which is an occurrence happening only once in every 3,000 tortoiseshell kitten births. Quickly gaining the attention of the nation, it was Justin and Cass who first fell in love with the affectionate and outgoing kitten. 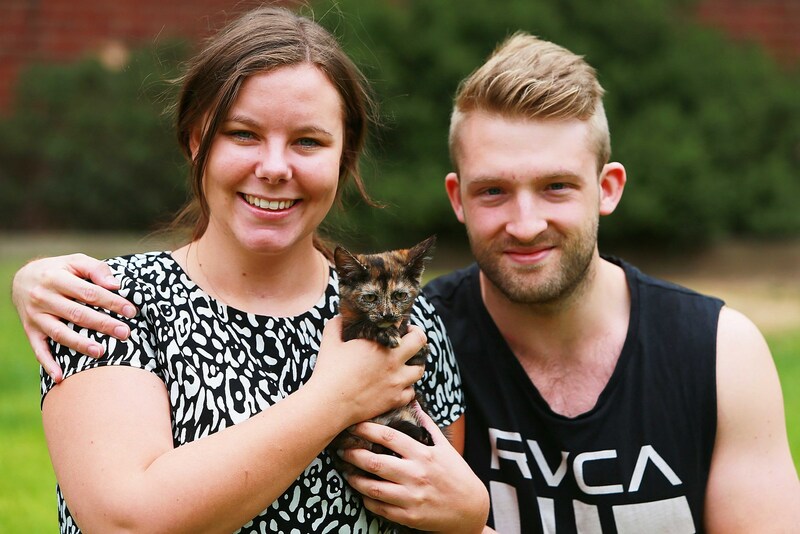 “We had come to The Lost Dogs’ Home wanting to adopt another tortoiseshell kitten who had caught our attention, but they had been adopted and were going home with their new family that afternoon. 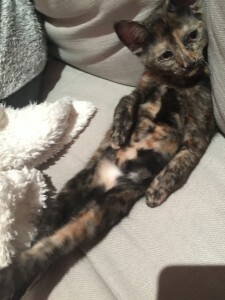 “Not to be discouraged, the Home’s adoptions team told us about another kitten with tortoiseshell colouring who was available for adoption. “As soon as we saw him, we knew he was the one! He was so calm and carefree when we held him, to was obvious that he felt comfortable in our presence – also his big ‘hug me’ eyes were just too powerful to refuse,” said Cass. Now known as Albus, this four month-old quickly made himself at home seamlessly adjusting to Justin and Cass’ lifestyle. “We live in a small unit, which is perfect for the little man. As soon as he arrived he set about exploring all the nooks and crannies of his new home. 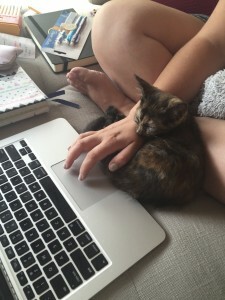 “He is certainly very comfortable around us, often snoozing in our lap, or, rather annoyingly, falling asleep on our laptop keyboards,” said Cass. After first winning Justin and Cass over at the Home, Albus has fit into his new home with his loving and loyal nature. “He is very happy living with us, and that is a great feeling. We love how snuggly he is, but also how hyperactive he can be – especially at night! 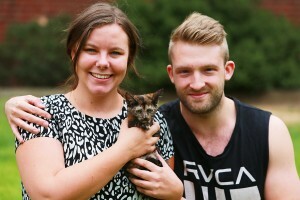 For Justin and Cass, it was important for them to adopt their new companion from an animal shelter, such as The Lost Dogs’ Home. “We’re firmly of the belief that when we bought our first cat we would do it in a way that helps our furry friends everywhere. There are thousands of animals in need of our love and are, now more than ever.